The MINDKISS Project has now been running non-stop for over ten years. 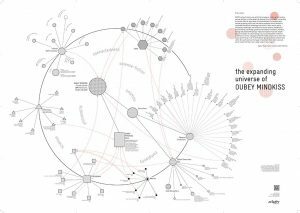 From 2005 to 2010 we were working behind the scenes to be absolutely certain that the public presentation of a first small part of OUBEYs work was professional enough in its preparation to match and mirror in every way OUBEYs understanding of art and life. The pyrotechnics of the book release, the Experience Film and the Web Opening on 23 March 2010 in the ZKM | Centre for Art and Media Karlsruhe marked the move from behind the scenes to the glare of the limelight. What has developed and grown since then has been truly tremendous. Its course is charted and can be followed on OUBEYs website, in the social web and in the map of the “Expanding Universe of OUBEY MINDKISS“. The 5th anniversary of our first appearance in a growing worldwide inquiring public interest was celebrated last year in exactly the same place from where we first launched the whole project in 2010 – at the ZKM |Centre for Art and Media Karlsruhe. And now the time has come for us to pause and take a breathing space. We shall take time-out to ponder and reflect on all the incredibly diverse and intense experiences we have made in recent years, and all the insights we have gained and been enriched by. This is something we’re really looking forward to. We shall use this breathing space to delve deeper into the coming worlds of OUBEYs previously unpublished works which constitute an uncharted territory of vast proportions. Then we shall resurface with new paintings and new ideas, and even now we’re thrilled by the prospect of sharing these pictures and the ideas OUBEY attached to them with the world. When this will be exactly, we cannot say. It’s an open-ended process which will march to the beat of its own drum and take its own time, and we shall be sure to give it all the time it needs. During this time, however, we shall continue to publish our blog and continue as usual with a monthly posting that leads deeper into “OUBEYS World” of thought and creation but also into the world of the OUBEY MINDKISS Project. We hope that we can continue to count on your support in this new venture and that you will continue to follow interactively whatever course it takes. Das sechsteilige Filmepos StarWars von George Lucas gehört nicht nur zu den Filmen, die OUBEY besonders liebte. Es ist wohl eins der fantastischsten und großartigsten Werke der Filmgeschichte. Last night was “Game Over” for our Share&Win lottery on occasion of the 5th Anniversary of the OUBEY MINDKISS project launch.